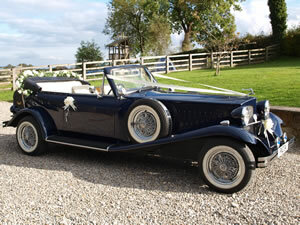 View Car Beauford Tourer Convertible Fit for any special occasion our 1930's style Beauford Open Top Tourer will ensure heads turn as you arrive in elegant style. View Car Beauford Tourer Saloon With its classic and elegant style our 1930’s Beauford Saloon makes the perfect relaxed transport from a bygone age for your dream wedding and will look fantastic in the wedding photos. "You have really added to the whole overall experience by being reliable, accommodating and utterly professional yet warm and easy going. We cannot speak high enough of you guys! " Susanne. 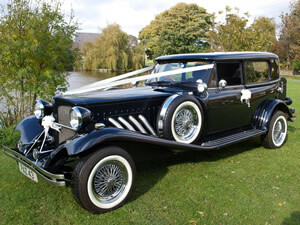 Arrange to view our wedding cars and discuss any special requirements for your wedding day with us. Our wedding cars come trimmed in ribbons, bows and floral decorations to match your own colour scheme. We can also offer a champagne toast after your ceremony to make your day even more special.